Designed to cater for larger clients. Higher weight capacity and larger overall seat area. 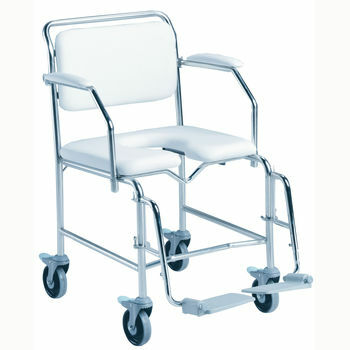 Durable reinforced stainless steel frame for increased strength. Padded back rest for added comfort. Removable arms for unrestricted side transfers. Comfortable padded PVC arm rests. Swing-away, removable and adjustable height foot rests. Front & Rear Castors 125 mm diameter, locking.